Langtang valley plus Gosainkunda Lake Trek lies in the central part of Nepal which is closer to north of Kathmandu valley and to the south of Tibetan border. 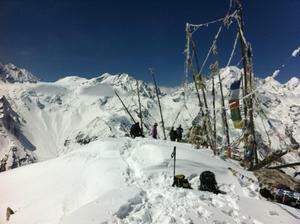 It is one of the nearest treks from Kathmandu. It is sandwiched between the main Himalayan range to the north and a slightly lower range of snowy peaks to the south Langtang Lirung (7,246m), to the north (Gang Chhenpo (6,388m), to the south Naya Kanga (5,846m and to the east (Dorje Lakpa (6966m). In the high mountain, Tibetan culture existing and in the down hills Mostly Tamang, Gurung, Brahman, Chettri and others. It is the habitat of world endangers animal Red Panda. The trek passes through varied landscapes ranging from evergreen forest, cascading waterfalls and turbulent streams to alpine grass and barren mountainsides. This trek offers pine forest, swift mountain streams, rugged rock and snow- capped peaks, grassy downs and meadows strewn with daisies and wild primulas. It has unparalleled combination of natural beauty and cultural riches. Gosainkunda Lake is the sacred lake both the adherents of Hindu and Buddhist faiths, is also known for wonderful scenery where pilgrims congregate on specific days of the year wash off their sins. In the upper part of the valley there are snow ridges spanning angry torrents, high passes enveloped in mist, tiny lakes of crystalline brightness and glaciated mountain. It offers plenty of scope for amazing scenery of unscathed woodlands, enormous glaciers, lakes and snowy peaks. Langtang valley Trek offers the massif views of Langtang Lirung, Ganesh Himal, Dorje Lhakpa, Manaslu Range, Maluntse and many others peaks. Above mentioned Trip dates are the fixed departure date for Langtang Gosainkunda Lake Trek 2019. The cost mentioned in the tables are the cost from 6 to 12 peoples in a group. This trip can only be organized for minimum of two people upon your request. A group booking of 10 or more people is subjected to a maximum discount with the availability of free trip to one person. If your group is much larger please contact us to discuss about the price. Transportation: Kathmandu to Syabrubenshi and Melamchi Bazar to Kathmandu on private transportation.